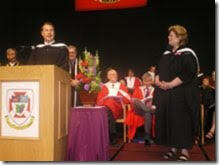 In 2012, Susan A. Thompson was a recipient of the University of Winnipeg’s Distinguished Alumni Award. This award honours graduates of the University of Winnipeg who have distinguished themselves in either their chosen profession or in their community. The Distinguished Alumni Award was established in 1990 and is the Alumni Associations highest tribute. 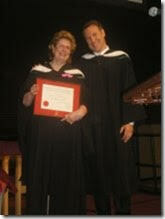 Susan’s history with the University of Winnipeg began when she worked in a summer job at the library at the university. In 1967 she graduated from the University of Winnipeg Collegiate and then in 1971 she graduated with a Bachelor of Arts. Susan went on to have careers in retail; politics; and as a Canadian diplomat in the USA. In 2003, Susan returned to Winnipeg from the USA, to become the founding President and CEO of the University of Winnipeg Foundation. The University of Winnipeg received its charter in 1967 but its roots date back more than 130 years. The founding colleges were Manitoba College (1871), and Wesley College (1888), which merged to form United College in 1938. The University of Winnipeg, located in the heart of Canada, is a compact, diverse, multicultural academic community committed to access and excellence. The University of Winnipeg is a provincially and privately funded post-secondary institution with undergraduate and select graduate programs, as well as Collegiate and Continuing Education divisions. The University of Winnipeg is large enough to offer over 800 courses in more than 40 subject areas from Aboriginal Governance to Women’s Studies, yet small enough to make sure students connect with the University’s award-winning professors. Home to more than 9,200 full- and part-time students, UWinnipeg is consistently ranked in the Top Ten of all Canadian universities when students are asked about their “Entire Educational Experience” by both Maclean’s magazine and the Globe & Mail annual Report Card. Do you want to be inspired to reach for your dreams too? Click the link below to buy your own copy online, right now.